The crew from Imagination Labs wanted to track the number of cups of tea consumed at their office. They designed Activitea, a project incorporating a series of sensors placed throughout the London Imagination office that count the cups of hot drinks made in every kitchen. 1. 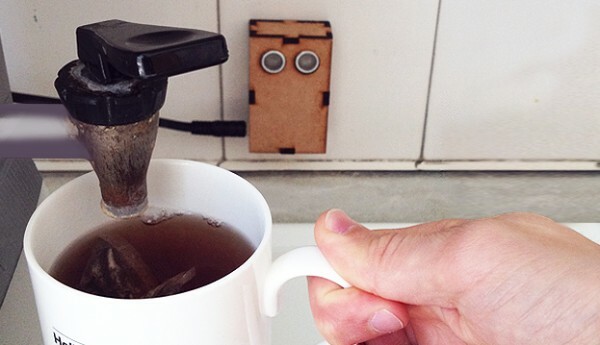 A ‘tea counter’ object housing an ultrasonic sensor. 2. A receiving/transmitting object, housing an Arduino and a digital transmitter module. The ultrasonic sensor senses the presence of a cup, which is then logged by the Arduino and submitted to an online database. Cumulative consumption data can be viewed here. For more photos and description of this project, visit the Imagination Labs Activitea page. This entry was posted on Monday, October 8th, 2012 at 3:00 pm	and is filed under Arduino, sensors. You can follow any responses to this entry through the RSS 2.0 feed. You can skip to the end and leave a response. Pinging is currently not allowed.